As a lady who is constantly scribbling down notes about this, that and everything, I am something of a buyer of stationery. I love a nice notebook and for that reason, am somewhat in love with the rather beautiful item that is the subject of my blog today. In fact, I posted a picture of the stationery in question on my Facebook page some time ago and it made quite an impact, so the time seemed right to let Queen Charlotte's notebook take the spotlight, just as her diamonds did recently. 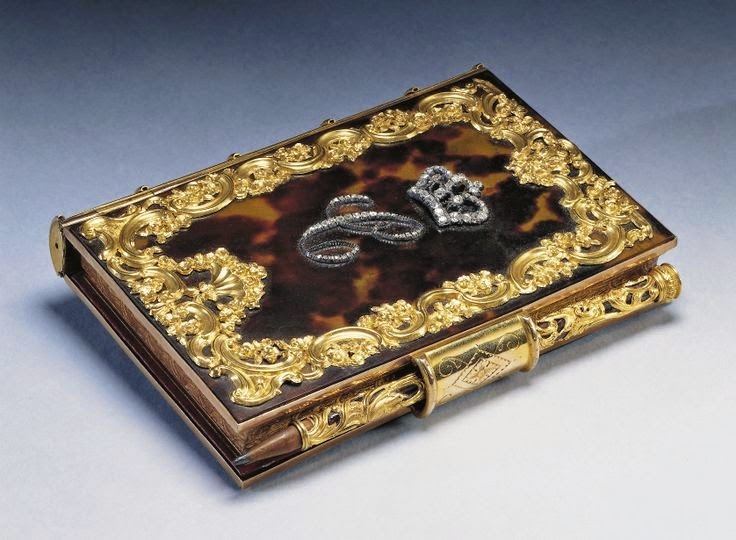 This stunning notebook was made for Queen Charlotte in 1765 and is a rather dazzling concoction of tortoiseshell and gold, with Charlotte's monogram picked out in diamonds. In case the whole thing was a little understated, a similarly dramatic pencil is securely affixed to the book so that Charlotte might never be at a loss when urgent notes were required. In spite or perhaps even because of its rather elaborate appearance, the pages of this remarkable notebook remain unused. In fact, Queen Charlotte preferred a more spartan book for her writing and it remains in perfect condition, as fresh today as it was at its creation. I once attended a book signing of an author I was very keen to see, and I wanted to take notes on her talk. So I wandered around the bookstore till I found a beautiful journal with metallic design on the cover, blue with silver and hues of blues.You'd have to see it. But after taking the notes (and receiving her email address in her hand) I had 99% of the pages left over. I didn't want to dilute the sanctity of the journal with trivia like grocery lists, so it sat next to my bed for some few years. Well, what better use than to jot down notes about ideas for my novels when the thoughts kept me from sleeping? It is now half full of Wills and Emma and Dante and Evangeline. Some of the ideas were later dismissed, but many were incorporated. I'm assuming that someday the journal will be sold at Christie's... to the highest bidder... or, well, at a garage sale. Nah, I'm sure my kids will want it at least. Right? Hmm. I have quite a collection of lovely stationery that I simply can't bring myself to use for similar reasons. It feels like it has to contain things of importune, not triviality, aren't we a funny pair? Once that notebook goes to auction, perhaps a future blogger will write a post on *your* notebook! That's a fantastic idea, I would love to see some of those baroque books! I am trying to get back in the habit of writing down my thoughts at the end of the day. I have been given some lovely journals that seemed such a waste to leave blank. I doubt mine would be of any interest after I am gone, since my entries are usually about work or my private thoughts and feelings. I think they would be of more interest than you might think; diaries are such a unique and rich insight into a person and period. how lovely to keep journals in a beautiful book too, it must be inspiring. I love notebooks. I buy them covered in words and 18th century illustrations but my favorite has gold Fleur de lis with a jeweled clasp. Of course they are not real sapphires but they look like it. This is one I keep on my desk and for permanent information. I echo Catherine's thoughts; my mother's commonplace reflections on her life growing up during the war quite fascinating, and she's having to recall thoughts to write down later. We are living in interesting times, like it or not, and the thoughts of a selection of people during this period will show how that reflects on most lives. Jane Austen's letters say little of the politics of the time, which is in itself interesting, that she felt herself untouched by the war with France in most respects. Ooh, is there a photo? Many thanks! I enjoyed doing them, too, and it's wonderful to pick up something pretty to use, much more inspiring!